For two days this week Skip, Bob & I went 4wd truck camping to scout for future outings. Our 1st destination was the 359 acre Jerseyfield Lake in Herkimer County which, we discovered, is privately owned and gated. From there we proceeded northeast on the Powley-Piseco Road, one of the last old Adirondack dirt roads, extending 17 miles from Stratford northeast to Route 10 near Piseco Lake, cutting through the center of the Ferris Lake Wild Forest. We checked out checked out Ferris Lake and Sand Lake. While the “Discover the Adirondacks” guidebook describes the Ferris Lake as accessible through private lands we found it to be gated by a club. 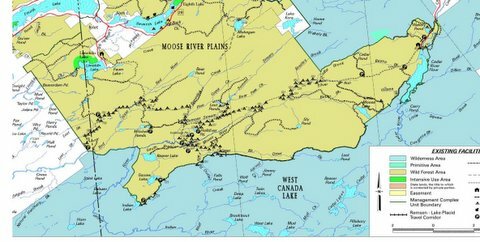 Possibly Ferris Lake could be reached via a long portage around the private holdings. From there we stopped in at the Hamilton County Offices in Lake Pleasant to pick up the County road map. We proceeded to Speculator up Elm Lake Road and travelled across the lease agreement International Paper Company roads. The land in this section was excessively logged about 100 years ago. In the 1930s, the Civilian Conservation Corps came in and created a plantation of pines, mostly scotch and white pines. We camped on State Land at the trailhead to Rock and Long Ponds at northern reach of the Kunjamuk River. This trailhead is on the old Kunjamuk Road which was the major roadway between Speculator and Indian Lake in the 19th century. We scouted the Kunjamuk as a possible 2 day/overnight through trip. The weather forecast called for overnight rain continuing through Thursday we set up rainflys and successfully thwarted any rain. Thursday we drove north on Route 30 and entered the Moose River Plains from the Indian Lake access road. We spent most of the day driving the extensive dirt roads checking out roadside campsites. We explored the Otter Creek/South Moose access, Indian Lake and Squaw Lake. Otter Creek seemed to provide easy access to the South Branch of the Moose River which tranverses Adirondack League holdings before continuing through DEC land to Mckeever – a possible 2 day trip. Indian Lake was remote, beautiful with the fall colors and reportedly “dead” due to acid rain. Squaw Lake was accessible via a .45 downhill trail and it had a gorgeous campsite. We finally left the plains in Inlet with a loud muffler rattled loose from all the dirt roads.